Sara grabs ahold of the Death Totem and that goes basically exactly as you might expect. This episode is yet another return of John Constantine before his role as a series regular in the proposed season four of “Legends of Tomorrow.” “Necromancing the Stone” (great name by the way) is all about magical nonsense and this is a better platform than his show for his whole John Constantine: Wacky Demonologist schtick. His interactions with Ava add legitimacy to the relationship she has with Sara as she’s forced to defend it against Constantine’s irreverence and pessimism. The episode proper has a very claustrophobic feel to it, in sort of an “It” way as the Legends face their fears one by one at the hands of Mallus’ magic all to make them drop their guards. The Legends seem to be lost for the entire episode though. At no point was there a clear goal or sign of their ability to mobilize. The characters are all interacting in believable ways so it never becomes too much of an issue for the narrative, but it seems like they should at least have some sense of a coherent battle-plan as they have actually been in this situation (or something similar) before. Regardless the way the totem thing works out is a perfect mashup and Constantine trying to magisplain himself to Gary and Ava gets just the right amount of incredulity to be seen as skeptical without coming off as bull-headed. “Necromancing the Stone” forwarded the plot of the Legends’ season arc and added in a few moments that give Sara’s tragic, phantom, and generic past a sense of tangibility that lies beyond just talking or context clues. Wally’s interaction with Jesse was actually a high point for me that I think his character really needed. Legends has an opportunity to show a more emotional side of Wally and this proves that Keiynan Lonsdale is actually a pretty good dramatic actor, and could inject a lot of depth into Wally given the opportunity. Hopefully, that’s something that’s realized over the course of the season. This episode doesn’t waste any time making sure everyone is on the same page, with Anissa revealing the truth of their family to Jennifer in the first 10 minutes. From there it’s all about acceptance, and how difficult the journey is going to be for Jennifer compared to Anissa owing all to the fact that they are both different people who want different things. It puts Jefferson and Lynn on trial for not being more honest with their kids about the family that they were born in to and honestly it raises a worthwhile moral question about how a superheroic family could be ethically-bound to inform their children about the likelihood of their suddenly developing powers. What’s strange is that something “Black Lightning” is doing is making me ask these questions about comic book superheroes that I never asked before and so in that regard it might just be the most valuable of all the CW’s DC shows and even more so than Luke Cage which does something similar minus the family dynamic which honestly makes the show. Anissa is my favorite character. Her dedication to her rebellion as well as her family makes her complex. What’s more, because of her LGBTQ background, the effects of the things that plague superhero conventions are felt tenfold. For example, the episode makes an interesting reference to sexuality when it comes superheroes and how the conversation is almost always steered there when it comes to talking about female superheroes. Anissa seeing the backlash about her work when it comes to oversexualization is fascinating because it’s a worthwhile conversation to have and seeing this side of it in this context is really eye-opening and an example of the most effective aspect of “Black Lightning” within the superhero dynamic. 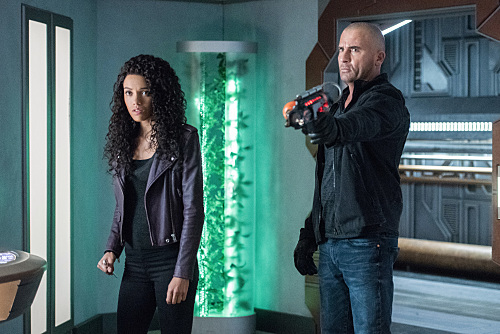 Then the episode does the most amazing thing that “Black Lightning” has done thus far as it juggles these big ideas while still presenting a worthwhile episode plotline, this time involving the shutting down of a lab where Green Light is produced, and Anissa and Jefferson going out on their first mission in full costume as Thunder and Black Lightning respectively. The whole scene takes a total of like seven minutes, but because we’ve seen how Anissa’s powers work and her journey to learning about them and how to apply them we can become invested everytime she uses them in the field. Comparing this to the way Jefferson uses his powers in the same scene just shows how useful a little bit of background exposition can be. Besides all of this two other characters get great storylines. Jennifer and Gambi get some redemption after being on the sidelines for a long time. Jennifer asks a lot of really difficult questions about the situation of learning about her family’s history to her mother Lynn, relating to her future, to her credit. It’s also incredibly painful for her to confront the unknown nature of her abilities and how it affects her life whether she wants it to or not. It’s refreshing to see someone actually break down at having to accept a life-changing event unexpectedly. Seeing Lynn lay down the law on Jennifer for acting out, as a mother, despite the situation, also really made me like her character more. Superheroes may be superheroes but sass is still sass and a parent can’t just let a kid walk all over them (Oliver!) It’s also pretty baddass seeing Gambi’s old spy tricks. He comes across as someone who’s really well-trained in aspects of espionage as we see all the tools of his craft. It juxtaposes these modern approaches of the application of his skills with his shady history and does a better job of building a redemption arc than most stories by creating this parallel in the here and now instead of trying to use suspense in place of a concrete arc. Final Word: Legends played on some great aspects of its dynamics including the way the characters interact to tell a compelling character-driven story and it also built on the season arc in an interesting way. 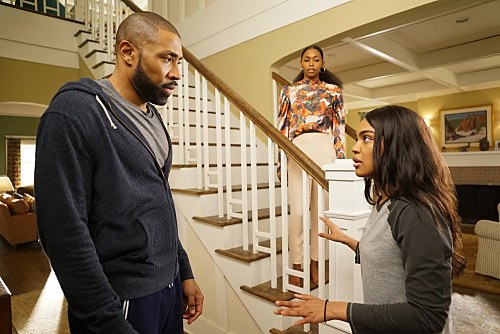 However “Black Lightning’s” “The Book of Little Black Lies” does what “Supergirl” tries to do every time and puts the dynamics of superheroics and the parallels with the real-world and it did it while still maintaining a compelling mystery and effective action. There’s a hint that “Black Lightning” might take place in the same universe as “Arrow” and “Flash” in this episode, and I gotta tell you I hope that it does. Because if there’s anything that “Arrow” needs to buy more of it’s what “Black Lightning” is selling.